Within the last five years, the use of social media as a tool for activism has exploded. Organizations are increasingly engaging with users online creating opportunities to reach large numbers of people who can donate money, sign petitions, write letters of support, and engage in other campaign activities with just a few clicks of the mouse. However, many consider these acts of online activism to be token displays of support that do more to make people feel good than to meaningfully further prosocial causes. It has added a major new element to the debate over “slacktivism”, defined as fairly effortless shows of support – typically public – that may make people feel like they are making a difference but don’t necessarily lead to much impact. Slacktivism includes activities like joining a cause’s Facebook group, wearing a specific color on a certain day, signing an online petition, or writing an email to a political representative. As organizations increasingly use social media as a campaign tool, the opportunities for slacktivism are seemingly endless. Critics of slacktivism worry that by engaging in these low-cost, low impact activities, people will feel they have done their part, discouraging them from engaging in more meaningful action. There has been some initial research on whether this is true. In their paper, Does Slacktivism Hurt Activism? : The Effects of Moral Balancing and Consistency in Online Activism.”, Lee & Hsieh found that signing an online petition increased the likelihood of donating money, but not the amount and while engaging in slacktivism increased the likelihood of performing a congruent subsequent civic action, the effect is limited to actions that are also relatively low-cost. Signing a petition did not increase or decrease participants’ intentions to participate in subsequent high cost actions such as attending protests; it only increased intentions to sign future petitions and write letters. Another concern is that groups that have many followers or members may suffer from a donation ‘bystander effect’ wherein members do not donate based on the assumption that others will. Kevin Lewis, professor of sociology at the University of California, San Diego, and two other researchers, analyzed the recruitment and donation activity of the “Save Darfur” Facebook page at the height of its campaign. Analyzing donation data over a a 2.5 year period showed that even though the group had over 1 million members, 99.7 percent never donated anything. The researchers concluded that signing up for the group may have offered enough in terms of reputational benefits that members did not feel compelled to take further action. That said the campaign still raised over $90,000. But how do online slacktivists compare to those who don’t engage in online activism at all? 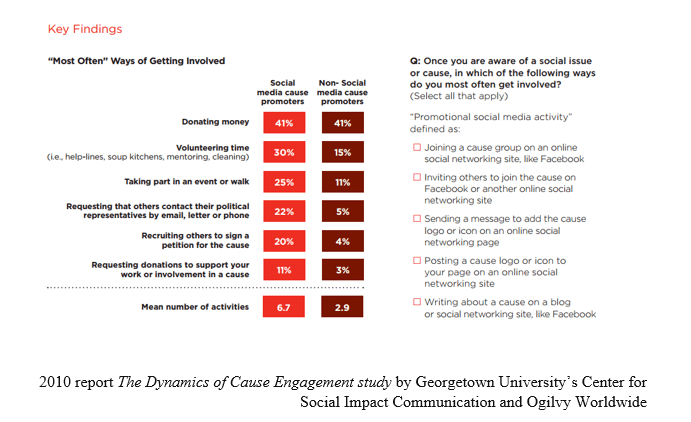 In a report by Georgetown University’s Center for Social Impact Communication and Ogilvy Worldwide researchers surveyed and compared social media activists to people who do not promote causes via social media. They found slacktivists are just as likely to donate money and more likely to volunteer their time compared to those who do not even engage in online forms of slacktivism. These data suggest slacktivists are willing to engage in more impactful activism and provide an argument against the point that slacktivism discourages more effortful acts of support. Social media inarguably provides a broad range of new options for promoting and supporting causes. And while some initial data seems to indicate that slacktivism does not often lead to more impactful activist activities, it doesn’t seem to hurt and it’s better than doing nothing.